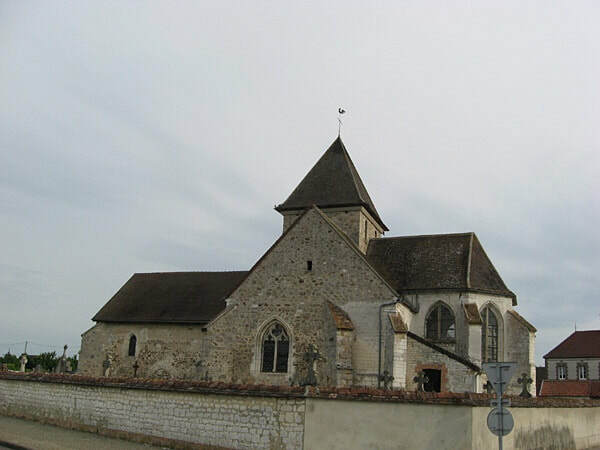 Granges-sur-Aube is a village and commune some 56 kilometres south-west of Châlons-sur-Marne and 16 kilometres south-east of Sezanne. The church is situated in the centre of the village. When Germany invaded France early in May 1940, the British Expeditionary Force had already been established there for some time. Between their dramatic evacuation a few weeks later and the Normandy landings of June 1944, Commonwealth forces activity in France was limited to coastal raids and special operations. Most of the Second World War Commonwealth cemeteries are situated in the coastal areas of northern France, but graves will also be found in communal cemeteries and churchyards all over the country, many being those of Commonwealth airmen who failed to return from missions over northern Europe. 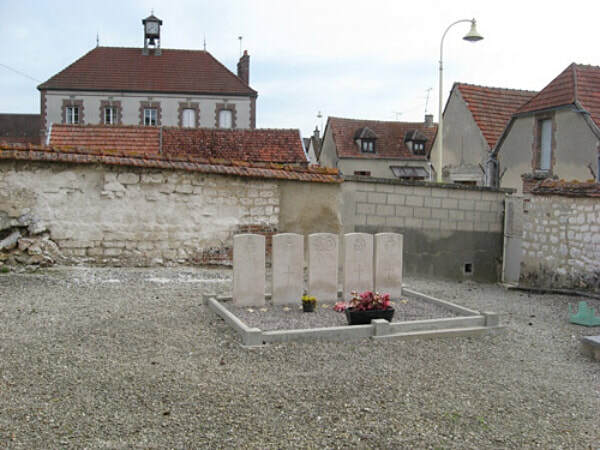 Granges-sur-Aube Churchyard contains the graves of seven Commonwealth airmen of the Second World War. Incident: The aicraft crashed at Granges-sur-Aube. There were no survivors. 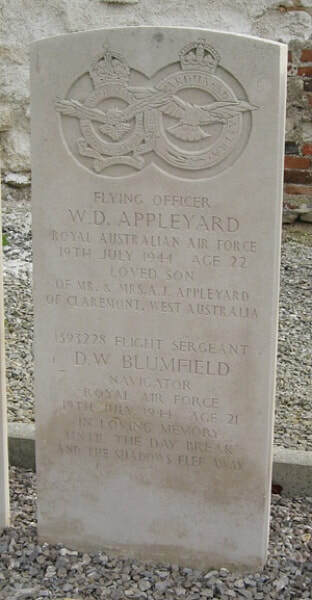 415716 Flying Officer William David Appleyard, Royal Australian Air Force, died 19th July 1944, aged 22. Son of Albert John and Jessie Margaret Appleyard, of Claremont, Western Australia. INSCRIPTION. LOVED SON OF MR. & MRS. A.J. APPLEYARD OF CLAREMONT, WEST AUSTRALIA. 1393228 Flight Sergeant Dennis William Blumfield, Navigator in 49 Squadron, Royal Air Force Volunteer Reserve, died 19th July 1944, aged 21. Son of William Smith Blumfield, and of Margaret Elizabeth Blumfield (nee Cameron), of Kingsbury, London. INSCRIPTION. IN LOVING MEMORY. UNTIL THE DAY BREAK AND THE SHADOWS FLEE AWAY. 1280638 Flight Sergeant George Walter Jameson, Air Bomber in 49 Squadron, Royal Air Force Volunteer Reserve, died 19th July 1944, aged 31. Son of Arthur Ollive Jameson and Eliza Jane Jameson, of New Malden. Surrey. 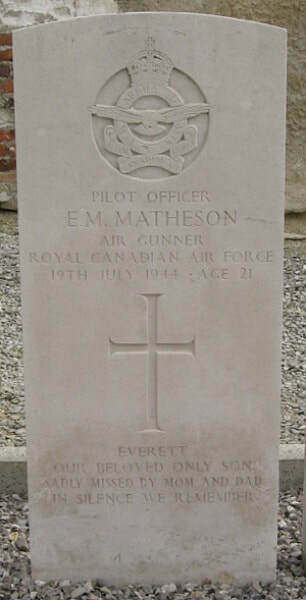 J/88476 Pilot Officer Everett Morley Matheson, Air Gunner in 49 Squadron, Royal Canadian Air Force, died 19th July 1944, aged 21. Son of Earl E. Matheson and Marion Matheson, of Vancouver British Columbia. Canada. 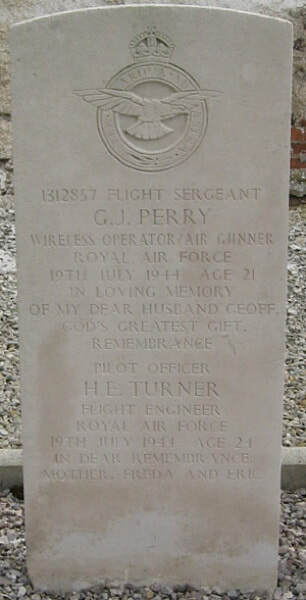 1312857Flight Sergeant Geoffrey John Perry, Wireless Operator/Air Gunner in 49 Squadron, Royal Air Force Volunteer Reserve, died 19th July 1944, aged 21. Son of Frederick and Edith Bessie Perry; husband of Irene Lilian Perry, of Tottenham, Middlesex. INSCRIPTION. IN LOVING MEMORY OF MY DEAR HUSBAND GEOFF. GOD'S GREATEST GIFT, REMEMBRANCE. 188991 Pilot Officer Howard Ernest Turner, Flight Engineer in 49 Squadron, Royal Air Force Volunteer Reserve, died 19th July 1944, aged 24. Son of A. Turner, and of Edith Turner, of Loose, Kent. INSCRIPTION. IN DEAR REMEMBRANCE. MOTHER, FREDA AND ERIC. 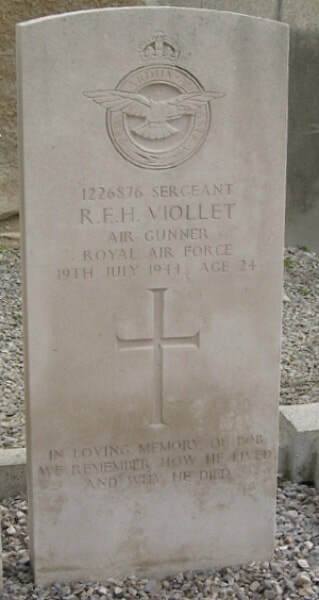 1226876 Sergeant Robert Frederick Henry Viollet, Air Gunner in 49 Squadron, Royal Air Force Volunteer Reserve, died 19th July 1944, aged 24. Son of Frederick and Ellen Viollet, of Reigate, Surrey. INSCRIPTION. IN PROUD AND LOVING MEMORY OF A DEARLY LOVED SON AND BROTHER. BELOVED BY ALL. INSCRIPTION. EVERETT OUR BELOVED ONLY SON, SADLY MISSED BY MOM AND DAD. IN SILENCE WE REMEMBER. INSCRIPTION. IN LOVING MEMORY OF BOB. WE REMEMBER HOW HE LIVED AND WHY HE DIED.